Guard intervals 1/4,1/8,1/16,1/32, Constellation QPSK.8PSK.16APSK. this product does not support Dobly or AC-3,if you want to watch the channels of this format,it will be no sound. 【Get More Channels】:The DVB satellite receiver supports full/blind search on single/multiple satellites. The channels depend on your local area. Generally Speaking,it can receive maximum 4000 service programmable. Of course, they are included some free channnels and many Premium Channels. It depends on what you want to watch. 【Easy to Operate】:it has easy menu system and powerful Service Control by Favorites, Lock, Skip, Move, Rename & Delete , supports 7-day EPG, Event Recording by EPG and Multi-Language (OSD & Menu). Note: if you want to receive the S2 signa, pls remember to switch it. It cannot support CccAM and IPTV. 【Compared with others】: DVB-S2 is global signal, T2 signal targets at Europe. It is so convenient to carry it to go to other countries. Of course, it is portable. Besides, the price is very reasonable.T2 &S2 combo can give you special experience. 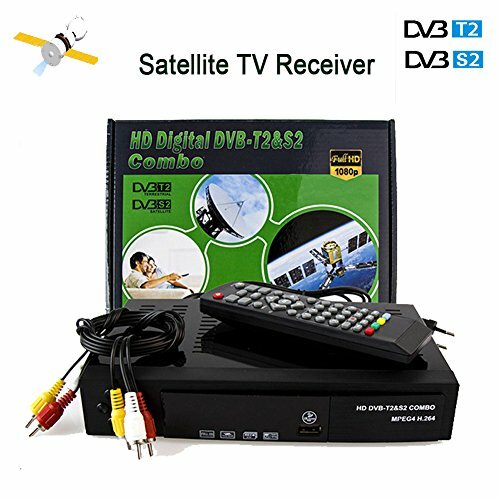 【What you Get】: a DVB S2+T2 satellite receiver with US plug; a remote controller; ; a HDMI cable; a user manua. Besides,we support 30 Days' Money-back Guarantee + 12 months' Warranty + Lifetime Technical Support via E-mail. Feel free to contact us if necessary. And you will get friendly service for sure. If you have any questions about this product by VOdmy, contact us by completing and submitting the form below. If you are looking for a specif part number, please include it with your message.